Here below a video illustrating the previous article. On the proto board, you’ll notice a 74HC595 controlling a ULN2803 plugged to 8 leds. 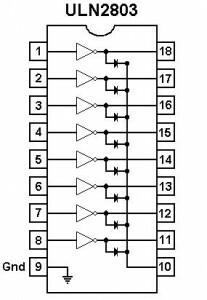 In the previous article, we have seen how to use a shift register to control up to 8 digital outputs (or more if you cascade IC’s). One drawback in the previous setup is that we had to use one transistor per digital output (to control a device powered by another source). So this is where the ULN2803 comes in : 8 NPN transistors and one common ground in one integrated circuit. See below a refreshed schema (compared to the previous article). Note that I have decided to power my IC’s with my (regulated) Arduino 5v but I could as well have used my battery pack power. Our 74HC595 will control our ULN2803 (by sending HIGH or LOW on the input) which in turn will drive the current thru each output/led. I have a wordclock project. 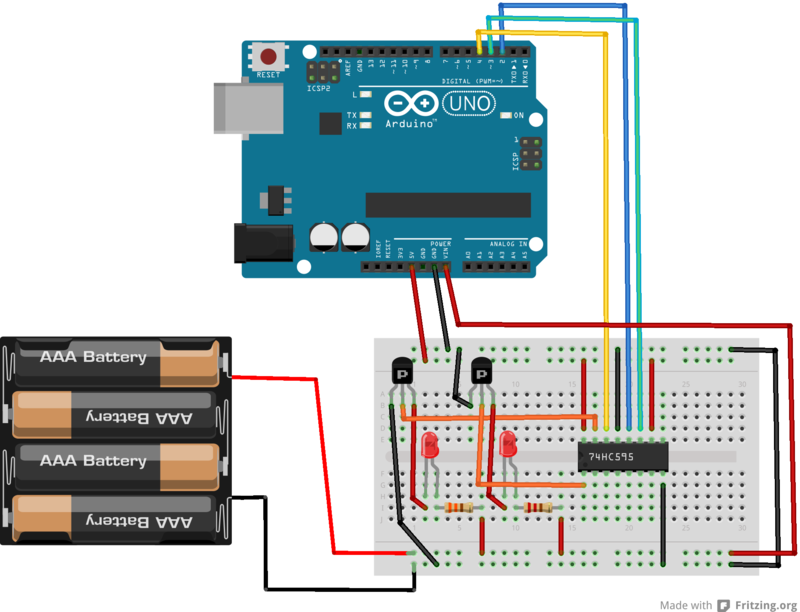 Before I get there, I need to learn about transistors (see previous article) to handle an external power source for my leds and a shift register to control lots of leds with an Arduino. Why am I not using the digital pins? 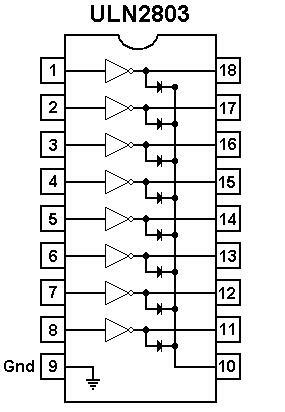 -a shift register (74HC595) to handle 8 outputs at once with only 3 pins. See below a wiring to use shift registers on two leds (it would be more impressive/significant with 8 leds with I was too lazy to draw it all). Notice that we also use our external power source to power on the Arduino thru the vin pin. About transistors, next evolution is to replace the serie of transistors by a transistor array like a uln2803a. And now the arduino sketch. 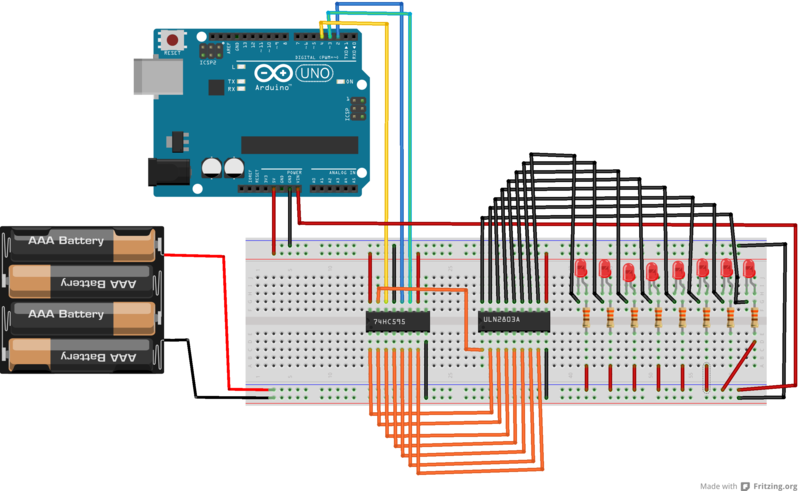 A common mistake with Arduino beginners is to use the board to deliver power . Altough it is ok for small devices such as sensors, leds, etc, it can only deliver 40ma (per pins) which wont work for more needy devices such as motors. There comes the transistor which lets a small current control a much larger one and your Arduino can therefore manage devices which are power supplied from a separate source. There are 2 sort of transistors : the PNP and the NPN. The PNP will turn on with a LOW signal whereas the NPN will turn with a HIGH signal. A transistor has 3 pins (looking at the labelled / flat side), from left to right : (C) the collector, (B) the base, (E) the emitter. 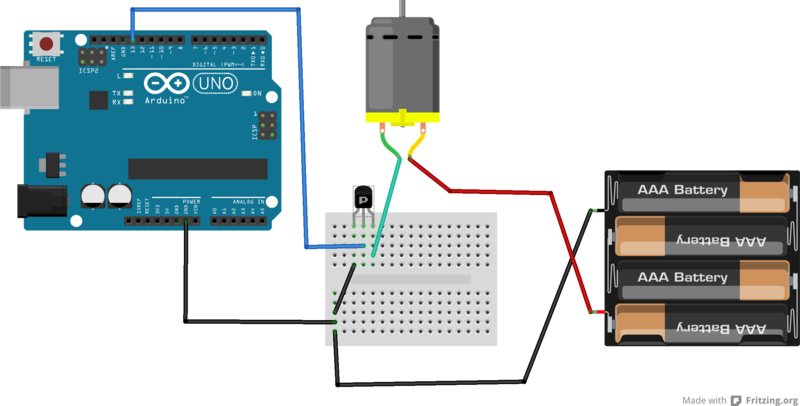 The base is connected to the digital pin of the arduino. The emitter is connected to the ground.